Endlessly sunny skies and sparkling sapphire waters make Cabo San Lucas one of the most popular beachside getaways in Mexico, which is why so many families, couples, and groups of friends continue to travel to Cabo San Lucas year after year. This stunning beach paradise is home to world-class beaches and great nightlife and dining, as well as a number of quality resorts. If you want to make the most of your time in this Mexico hotspot, consider staying at one of the Cabo resorts with water park slides. There aren't many vacation destinations where you can stay at a top-notch resort with water slides and water park facilities, but Cabo San Lucas is a unique vacation destination. Vacatia can help you book your stay at one of the Cabo San Lucas resorts with water slides so that you can experience a one-of-a-kind vacation that your family will never forget. Booking your stay at a quality Cabo San Lucas vacation rental is easy when you let Vacatia help plan your Mexico getaway. Whether you want to spend your Cabo vacation lounging on the beach, partaking in one of the many water activities available, or heading out into the open ocean for a fishing trip, you should work with Vacatia to book your stay in Cabo San Lucas. There are a number of luxurious resorts and hotels in Cabo San Lucas, but Vacatia can help you sift through the wide selection of hotels so that you can find a vacation rental that meets all of your needs. When you rely on Vacatia to book your stay at a quality vacation rental in Cabo San Lucas, you could even stay in a hotel whose pool offers a number of water slides. If you want to experience the thrill of water parks in Cabo resorts, be sure to work with Vacatia to find your ideal vacation rental in Cabo San Lucas. Vacatia's unique vacation rentals offer more than just a typical hotel or resort can, as they provide extra living spaces, such as fully equipped kitchens, in addition to the desirable services and amenities of hotels and resorts. Staying in a Vacatia vacation rental will make you feel like you're living in Cabo San Lucas rather than just visiting, and this is sure to make your Cabo vacation one for the books. Cabo San Lucas is home to great dining, nightlife, and beaches. This world-class vacation destination offers something for every type of traveler, from adventure-seekers looking to partake in water sports to honeymooners looking for a bit of R&R on the beach. 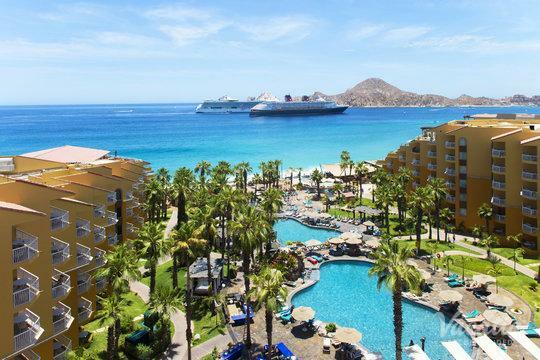 No matter what you have planned for your upcoming Cabo San Lucas vacation, be sure to make the most out of your trip by booking your accommodations with Vacatia. 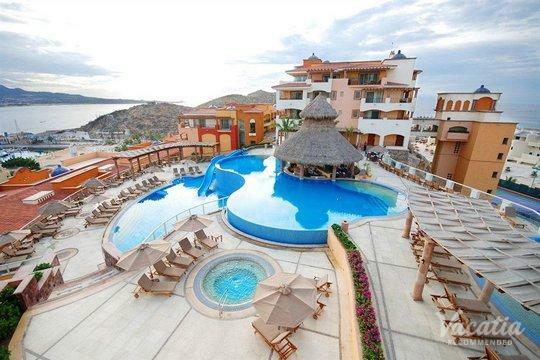 If you're looking to take your Cabo San Lucas vacation to the next level, book your stay at one of the premier Cabo resorts with water park facilities through Vacatia.